Please join us in thanking our Council Reflections chairs - Cyndi Pierzynski and Ny Derry! 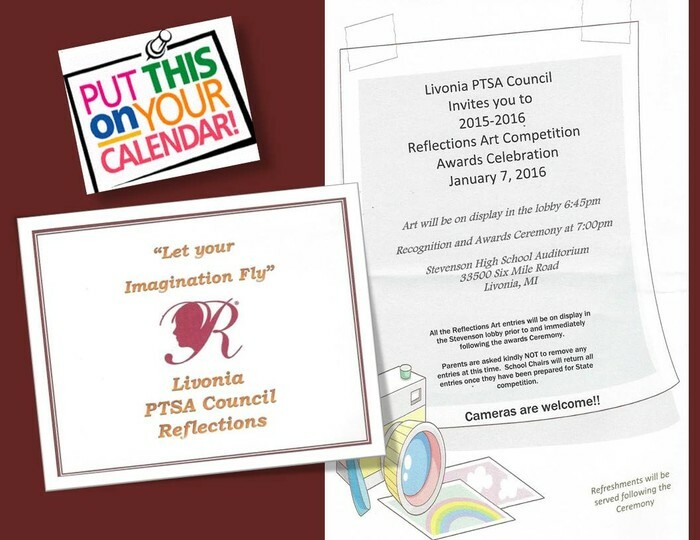 Thanks to their hard work, Livonia PTSA Council accepted 208 entries in this years Reflections competition (this almost doubles last years 112 entries!) That's fantastic news! Livonia PTSA Council winners will advance to MI PTA for judging! Good luck artists! 2016-2017 Reflections theme is: What's your story? When: January 16, 2016 from 11 a.m.-2 p.m.
Why: To get Dads, Grandpas, Uncles to join and support their favorite PTAs, earn money for their favorite schools, and have a great time while doing it. Male LPS teachers &/or administrative staff are welcome too!! A $5 admission gets you refreshments and unlimited chili samples from all of our entrants (while supplies last). There will also be hot dogs and baked goods for sale courtesy of the Franklin HS Patriot Inn. The 1st place “Dad” will take home a “Dadcentric” prize package, a $500 Art Program grant (from The Livonia Kiwanis Early Risers) for their favorite Livonia Public School, and bragging rights for 365 days. Potential Entries: All entrants MUST be male and a member of their local PTA. 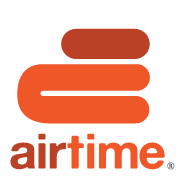 If you are not a member yet, there is still time to join. The entry fee is $10 per chili. Chili must be brought to the event in a crockpot, ready to eat. Feel free to dress up your table to wow the judges. Extra awards will include people’s choice, best dressed table, & hottest chili! Entry fee is only $10 per chili so sign up now! Volunteers as young as six years old can help pack meals. 1/3 of the meals will go to local food pantries. How? Sign up on www.eventbrite.com Search "Kids Against Hunger Meal-Packing Event"
1 HOUR * 20,000 MEALS * SIGN ME UP! LANSING – The State Board of Education adopted Tuesday seven Strategic Goals to help make Michigan a Top 10 education state in 10 years. The goals were developed over the course of four months, following formal presentations to the State Board of Education; discussions between State Superintendent Brian Whiston and state Legislative leaders; and input from a broad contingent of education stakeholders, specialists within the Michigan Department of Education, and the general public. "Nothing is more important to grow new jobs, see rising incomes, and create economic security for Michigan families than to educate all our people to the highest possible levels," said State Board of Education President John C. Austin. "An essential foundation is to deliver the essential skills needed in early childhood and K-12 education for later success. These goals will guide us to get where we belong in Michigan, among the top states in learning outcomes and educational attainment." Work will continue in the generation of strategies to accomplish these goals and how progress on those goals will be measured. Whiston is expected to bring a finalized plan to the State Board early next year. To realize Michigan becoming a Top 10 education state within the next 10 years, the existing structure and system of education must be challenged and reshaped. Michigan must establish an education system that grants indelible rights for all stakeholders to succeed – a system focused more on what is best for children and their learning. Goal 1: Provide every child access to an aligned, high-quality P-20 system from early childhood to post-secondary attainment – through a multi-stakeholder collaboration with business and industry, labor, and higher education – to maximize lifetime learning and success. Goal 3: Develop, support, and sustain a high-quality, prepared, and collaborative education workforce. Goal 5: Ensure that parents/guardians are engaged and supported partners in their child’s education. Goal 6: Create a strong alignment and partnership with job providers, community colleges, and higher education to assure a prepared and quality future workforce; and informed and responsible citizens. Goal 7: Further develop an innovative and cohesive state education agency that supports an aligned, coherent education system at all levels (state, ISD, district and school). ALEXANDRIA, VA — Today, President Barack Obama signed the Every Student Succeeds Act of 2015 into law. This landmark legislation—which received overwhelming bipartisan support in the House and Senate—reauthorizes the long overdue Elementary and Secondary Education Act/No Child Left Behind (ESEA/NCLB). Who doesn't like to go out to eat every now and then? Why not choose a restaurant that will give back to one of our PTA Units! Here is a handy list of generous restaurants that will donate to our Livonia PTAs, listed by date. 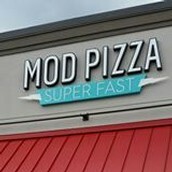 Please thank them for supporting PTA! and our Johnson PTA friends will receive a portion of your admission. Have fun, get some exercise and support PTA! Fundraise for your favorite PTA by going out to eat! 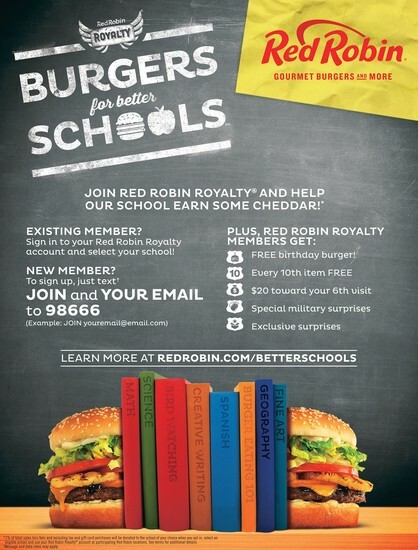 Have you heard of the Red Robin Royalty program? It's easy - just sign up online and select your PTA/school and 1% of every check will be donated to that Unit. No flyers. All year long. Yum! Many Livonia Units participate - does yours? The Livonia PTSA Council provides support and guidance to local PTA/PTSA units within the Livonia Public Schools District. Council promotes conferences, communications, leadership development and coordination of the efforts of the local units.